China’s 2015 White Paper on defense clearly states its ambition to maintain the security of its overseas interests and strategic sea lines of communication by entrusting the People’s Liberation Army (PLA) and the PLA Navy (PLAN) with the task of doing so. In light of this, the Belt and Road Initiative (BRI) has provided China a gateway for enhanced interactions and strategic developments in the Indo-Pacific region through which it aims to link more than 65 countries via an ambitious network of ports, rails, roads and other infrastructure, encompassing about 40 percent of the global GDP. China has invested close to 15 billion USD in Sri Lanka where its transnational infrastructure building program includes the dendro (biomass) power plant project, the Mattala airport, the Hambantota Port and a brand-new financial district called the Colombo Port City. Originally the brainchild of former President Mr. Mahinda Rajapaksa, the Hambantota port was originally intended to be a project between Sri Lanka and India. Ultimately, Mr. Rajapaksa allowed China to come in after India rejected the offer due to the lack of economic viability the port would provide. The port, which has been handed over to China on a 99 year lease, has considerable strategic influence since it provides China a maritime route to connect to Europe, which will further help Beijing boost its trade volumes. Aside from Sri Lanka, China’s steadily creeping influence has also expanded to other countries in the region such as Maldives. Since opening its embassy in 2012, China’s influence and interest in the island has grown at an unprecedented scale, which has caused disruption in the long-standing relations between India and Maldives. Under the leadership of President Abdulla Yameen, Maldives’ historically pro-Indian government has slowly been replaced by a pro-Chinese one. As a consequence, Beijing continues to expand its presence in this strategically important archipelago without much resistance from the new government. China signed a free trade agreement with Maldives on 8 December, 2017, the terms of which have been widely interpreted to be unequal. Under the agreement, the trade balance remains highly in favor of Beijing than Malé as the former has more goods to offer compared to the latter, which is mostly relying on the export of tuna and the flow of tourism to prop up its end of the bargain. Additionally, the China-Maldives Friendship Bridge, which recently opened on 30 August 2018, has generated apprehension that China may be using debt trap as a disciplinary tool to succumb Maldives to its demands and has intensified India’s concerns that it would plunge the island state into an economic crisis. The fact that China is financing a large number of ports in and around the region has also nettled India. Currently, China has a naval base in Djibouti and ports in Pakistan, Kenya, Sri Lanka, Myanmar and Maldives–all of these infrastructure have been placed under the rubric of the BRI. Despite China’s claims that these ports will be used strictly for commercial ventures, it seems likely that the accompanying military presence in the area will widen the range of capabilities and resources available to China and reduce the time required to deploy them. In light of China’s efforts to restructure the Indo-Pacific Region by making debt-equity swaps, India needs to consolidate its neighborhood and rethink its foreign policy strategies. Given the disparity that exists between China and India in terms of defense expenditure and military capabilities, the most pragmatic solution for India is to build domestic allies and partnerships, which can be achieved through several ways. First, India needs to expand its own set of connectivity projects in order to counter China’s growing influence in the region. The Asia- Africa Growth Corridor, which plans to link Asia, Europe and Africa, is one such project that fits into India’s plan for promoting economic growth, connectivity and development. Other ongoing projects include the Kaladan Multi-Modal Transit project with Myanmar and the long delayed Chabahar port project with Iran. When completed, these projects will give India access to other Asian markets as well as the North-South transport corridor with Russia that runs parallel to China’s BRI. Second, India should capitalize on the United States’ own attempts to strengthen strategic bilateral alliances. This pivot can be elucidated by the diplomatic and economic support the U.S. has provided India in recent years. The recent designation of India as an STA-1 country is an illustration of how the U.S. wishes to strengthen cooperation with India. Additionally, the Trump administration’s National Security Strategy includes plans to expand America’s defense and security cooperation with India to balance the rising Chinese power in the Indo-Pacific, with Washington’s envoy to New Delhi Kenneth Juster saying in January 2018 that India can become the alternative hub for U.S business in the Indo-Pacific region. Third, India’s readiness to modernize and develop its maritime infrastructure under the Sagarmala Project would eliminate its concerns regarding the Hambantota Port. Most of Beijing’s interest in Maldives can be explained by the island’s geographic location near the Eight Degree Channel. Not only does this channel contain valuable mineral deposits such as gold platinum, tin-iron, titanium and diamonds, it can also further augment China’s ability to dominate the designated sea lines of communication (SLOCs) through which Middle Eastern oil transits flow to countries in East Asia. India certainly can’t afford to lose its partnership with Maldives in the ambitious iHaven project, which straddles the Seven and Eight Degree Channels and aims to connect Southeast Asia and China to Middle-Eastern Europe; thus, playing a pivotal role in the global trade. Last, India should also continue developing a more robust bilateral relationship with China. To be clear, India should not compromise when it comes to border disputes; however, it should still pursue other channels of engagement. For example, the Informal Summit held in April 2018 was a unique platform for both countries to discuss each other’s concerns and interests. In the future, similar dialogues should be encouraged with the objective of setting more realistic and prudent goals for the future of Sino-Indian relations. To date, New Delhi has denied joining the Belt and Road Initiative due to sovereignty and territorial integrity issues. However, the bigger question to deal with is whether India, with its arsenal of strategies, will be able to block Beijing from filling in its colored pegs in this strategic game of Chinese checkers. If not, then India should be prepared for a future where all roads will lead to China. 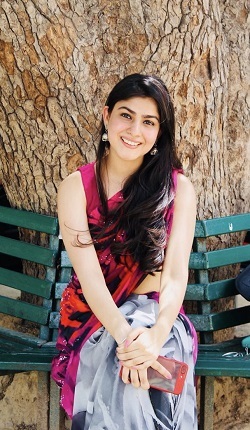 Radhika Chhabra is a graduate of Political Science from the University of Delhi and a former intern with the Indian Ocean Region Division at the Ministry of External Affairs, India. As a graduate, she is really enthusiastic about pursuing a career in strategic and disarmament studies.